Whether you're a newbie or an experienced Digital Marketing manager, we think you'll find digital marketing best practices and eCRM tips and links of interest on this page that will cover all aspects of building and managing an eCRM/digital marketing solution. As much of what is done in the online world was originally conceived in the offline world, we suggest that you also visit our traditional Direct Marketing section as well when considering eCRM best practices as some of the best digital marketers we know, are classically trained direct marketers. The online channel should be considered a prong in an integrated, multi channel strategy designed to improve not only your company's bottom line, but also its relationships with its customers. After all, we take the point of view that marketing is a profit center, and it's open for business! And what's a business without customer relationships? "Basics" as a title of a section is probably not the best - given the fact that most people think that they do the basics quite well. While that maybe true for you, in our opinion, it is not necessarily true for most. For this reason, we encourage you to read this section. If you feel compelled to skip this section, scan the synopsis below; consider it a reinforcement for what you already know, and continue on. - Most of the action is "above the fold"
Now, for the Basics. As you delve into this realm, it is imperative that you have a semblance of technical knowledge. While you may never understand your software engineer's incomprehensible sentences, you MUST understand the basics. This section will be an important guide when planning and implementing your Internet marketing strategy. Having trouble coming up with a domain name that isn't already registered? Try this nifty tool or this domain name generator. For more on search engine optimization, check out our search engine optimization marketing section. Granted that most of the good URL names are taken. If that proves to be the case, then something to consider in developing your site name is to go beyond the obvious. We know that short, memorable names and brands can be incredibly important in launching a new company, product or web site. There is always a tension between using an English word that has an obvious meaning and using something less obvious that you can create meaning and affinity around - just look at TiVo and Kiva. Another oft-overlooked area by eCRM marketers involves your site's address. 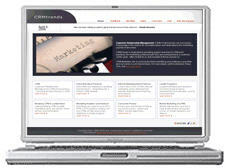 CRMTrends can be accessed by either typing in www.crmtrends.com or http://crmtrends.com. As both address conventions are commonly used by Internet surfers (typing addresses with and without the 'www' prefixes), you will want to ensure that your site can handle traffic for each preference. It is not uncommon for sites to only handle addresses typed with the 'www' prefix. That means that users who have a habit of dropping the 'www' prefix when addressing a site, will not be able to get to your site, making for a very poor user experience and potential lost business. A trip to your webmaster maybe in order to ensure that when they set up the DNS field to accept 'www,' that they also filled in the default DNS field to allow those who do not use the 'www' prefix to also find your site. It is a common enough occurrence that we felt compelled to raise the issue on these pages. While there are plenty of web sites already dedicated to the building of Internet sites, the faux pas of too many eCRM marketers requires us to touch upon this area - as too many sites fail at this most basic stage. First and foremost, before the architecting on your site even begins, eCRM best practices dictates that you write a Creative Brief. What is the purpose of your site? Once you have that in hand, stick to that brief religiously and return to it often to make sure you're still on track. The Creative Brief must lead you in every stage of the development. Do you want to know what design conventions may work well in your industry? Look first to your competition. Look closely and critically at your competitors to evaluate what design elements have been successful in the past. You can use search results to gauge which sites have better optimization. Keep in mind, however, that the most successful competitors will likely be better positioned in search engines because of the factors that made them successful, not necessarily only SEO (search engine optimization)-specific activity. The graphical design of your web site will be a key building block of your business image. Design is one of the most core decisions in creating of your corporate image because it creates an instant, visual representation of your company's presence. Design decisions must carefully balance aesthetics and usability, but mind though that it is equally important to consider search engine optimization in the design phase. Certain design decisions can have a disastrous impact on your placement in search engines. It should go without saying that in building your site, make it so easy to use that a monkey can navigate it (a good usability group or focus group should help here. Monkey's are available at your local zoo). Consider your target audience and market niche. Is your audience Internet savvy, or are they newbies? Will they read complex instructions and navigate to find information, or do you need to sell a simple and direct message quickly? Let your site user profile influence the structure and complexity of your web site. We can't stress enough that real consideration into your layout and site navigation will go a long way toward user/consumer acceptance of your site. Finally, consider whether you plan to make your web site ADA compliant (American's With Disabilities Act) - if you're a large corporation, you may want to give yourself cover from frivolous ADA lawsuits. The World Wide Web Consortium (W3C) has developed a set of guidelines geared at making the Web more accessible to those with disabilities. The W3C's User Agent Accessibility Guidelines lays out the accessibility features required in browsers and multimedia players to allow those with different abilities to access the Web. It addresses HTML and XHTML browsers, multimedia players, graphics viewers and assisting technologies. As these guidelines will fundamentally impact your web site building efforts, make sure you discuss these initiatives before beginning any site building or redesign. Now for the more technical aspects of building your site. This is usually where eCRM marketers tune out. DON'T. Your input at this stage is critical. eCRM best practices says that first and foremost, make sure that your site is supported by the key Internet browsers (otherwise known as browser optimization). While your page writer will tell you that 95% of browsers are Microsoft, don't let them take the lazy way out and optimize for only one type of browser (aka Microsoft). Good CRM dictates that your site support at least Microsoft and Netscape (both PC and Apple versions). There has been a tendency by many sites to show a "best view with" browser button on their home page. The fact that the button had to be put on the web site not only advertises the laziness of the site builder, but it is, more importantly, insulting to your visitors using another type of browser. So don't do it! Browser optimization not only includes browser type, but also browser version. When planning browser support, plan to support Chrome 46, Microsoft Internet Explorer 8 and Firefox 42 and higher. For another listing of browser versions, click here. Next in our consideration is monitor optimization. 1024x768 is currently the most widely used screen size. With this, we're not advocating hard coding for 1024x768 or higher pixels, but are suggesting that good page design will allow your text to flow around graphics. By using tables you can get the flexibility to make your page appear well on any size screen resolution. A good table design is one that uses percentages instead of fixed widths. That way, a screen will look good from 800x600 all the way up to 1600x1200. In considering window size, also consider how your customers are going to access your web site. Will it be via computer or some type of mobile device? The Apple iPhone and its successors are clearly an important evolutionary step for mobile internet usage and commerce. The iPhone's ability to render full sized web pages onto a nice sized display that allows for an easy read and simple navigation will hasten mobile internet access. As such, get your web site iPhone ready! A relatively easy way to do this, that requires minimal investment and developer efforts, is to make sure that your web pages work smoothly on the iPhone and other mobile browsers that render full web sites. Regardless, the era of mobile access has arrived. As such, make sure you stop by our mobile marketing section as well. How heavy should a web page be? As Internet connection speeds continue to increase, the answer to this question continues to be a moving target. The simple answer is, it depends. What is the purpose of your site? The popular search engine Google became popular for two reasons: 1) it was good 2) it loaded faster than any other search engine (few graphics). If you're a destination site (e.g. entertainment site with streaming video), visitors may be willing to tolerate slower page downloads. If you're a frequently visited site (e.g. search engine), the answer is likely otherwise. Experience and eCRM best practices tell us to not underestimate page weights. Depending on your audience, some surfers may access the web at home where dial up remains the web access du jour (especially in the country). And just because these people have a 58.8K modem, doesn't mean that they're connecting at that speed. They may well be connecting at 26.6K or 44.4K (depending on the cleanliness of the phone line). Given that, we tend to plan for the worst-case scenario, we suggest keeping pages under 64K (max) total graphics and text. Does this mean that you can't have a 100K page No. Our page weight number is somewhat arbitrary but just remember, there are trade offs regardless of what direction you go. 3) we traded graphics for text to manage our page weights (note: CRMTrends identified trade offs associated with all 3 and made a decision recognizing the liabilities). The first letter of the first word is always capped along with any proper nouns. Names of a section, PDF titles, features, brand names (e.g. Visa or Timberland), etc., are all considered proper nouns. Example: If you have an active link that reads "Click here to purchase the Razor Scooter" The "R" and the "S" in The Sharper Image's "Razor Scooter" is capped as we are describing an actual product (proper noun). Using sentence format for links is considered aesthetically pleasing - especially when you have long link "descriptors." An example would be, "Learn more about this product." In this case, nothing is capped except for the "L" in Learn. If this sentence were in a capped format, it would look like this: "Learn More About This Product." As this is a link and not a header, page title, or subhead, we come across as if we are screaming at the customer. It's even worse with longer link descriptors. In a nut shell, avoid using the every-word-capped format for long links and make sure that every link on your site follows the standard sentence format. As always, there are exceptions - It is possible to cap every-word IF you make all of your link descriptors short and sweet. Take advantage of online or text editor syntax checkers to make sure your HTML code is formatted correctly. We recommend this site as a great place to start with your links. Be very careful with other applications that require high bandwidth e.g. flash, Real Audio, or shockwave style plug ins. Most of these applications risk poor browser optimization (not to mention that too many effects can harm your search engine readability) and require a download (thanks to Microsoft) and thus can be a major dissatisfier for your customers. Users that surf for information or products don't want to be distracted by site overhead. Play to the MTV attention span generation. These visitors want quick viewing without interruption. There are plenty of sites that require you to have the latest downloads just to visit the site. As many users don't have these plug ins, most of these folks will tend to leave very disappointed. And you without a customer. The creative brief you used in building your web site should guide you in what is appropriate to your unique situation. Frames are considered not to be search engine friendly. Using frames will limit the number of different page addresses that you have on your site. Since the number of pages is counted for the site value and relevancy be search engines, you need to create as many pages as you can. Using a Non-framed site will also facilitate your users when they use "Add to favorites" or copy your URL to specific page, since in the framed sites all the pages adopt the home page address. Now that you have your site up and running on the test server and before you proceed to the other sections of this site, quick question. Does your Internet offering match or exceed the expectation that your customers have of it? If the answer is yes - job well done. You're ahead of the vast majority out there. Another oft overlooked area by eCRM marketers. eCRM best practices state that you should create a custom 404 page for your web site to catch any visitors using a dead link into your web site. This could be a site map of some kind to permit the visitor to get to the section they were seeking as easily as possible. Monitor arrivals to this page in your logs and if any are coming from links on other web sites, contact the webmasters to get their addressing updated. Many hosting companies offer a 404 redirect page. This means that when a user enters the URL of any page of your domain, and that page does not exist or can no longer be found, you can automatically redirect the user to a specified page - usually the home. We prefer a redirect to a specified error page with a five second delay allowing the user to get a full explanation of the issue - then a subsequently redirect to the homepage vs just an unexplained redirect to the homepage without any explanation of why the user ended up there. For "moved" page, consider displaying a 301 redirect page vs the standard 404. The code 301 means "moved permanently" and it's the easiest way to preserve your search engine rankings for that page. When delivering pages to the visitor that solicits information that, by any stretch of the imagination, could be considered personal, use Secure Sockets Layer (SSL) encryption technology to ensure personal information is secure and protected - err on the side of safety (SSL does encrypt the transmission of information, it does not protect the data once it is on your server). It never hurts to reiterate your site's concern for privacy on these pages through the use of verbiage and images. Don't believe us? A Harris Interactive survey found that "consumers are willing to change their behavior if they feel a business has established strong and trustworthy privacy practices." Almost half of the consumers surveyed said that they would spend more, buy more frequently, and recommend that company to friends and family if they felt comfortable with that company's privacy practices. The survey also found that 90 percent of respondents felt it was important for a Web site to contain a privacy notice; half of all participants actively checked for a seal or symbol that a Web site has good privacy practices; and 60 percent checked for a "similar seal or padlock that the Web site has security features in place." You can never make your customers feel too secure. As we encouraged at the beginning of this page; hopefully a creative brief was guiding your site building activities. In that brief, you would have identified your target audience. Now that you have completed the site, write down two or three explicit goals that you had for your site. Then document assumptions about two to three of your most important target users. Give them names, ages, jobs, and locations to help make them come alive. Include their level of web expertise and how much they know about your product and/or service. Then write descriptions of goals you believe they have - writing to a realistic level of specificity, e.g. "Jane wants to book a room in a hotel near the Las Vegas strip that has wireless internet access and a large 24-hour gym in it." Next, try to accomplish those goals. Sit down at your site and attempt to buy the right product, find the essential information - whatever goal that your user would set out to accomplish. How well did the site deliver on the user's expected experience? Too often marketers do not put themselves in their customer's shoes nor put themselves through the user's experience. Passing the "Monkey Test" (is it so simple that a monkey can do it?) is a criterion for good CRM. America has become a nation of track-a-holics. This is a trend you may want to consider incorporating into the user experience. Consumers want to go online and track the whereabouts of everything we order or do. It's sometimes because we need to know, but often it's simply because we want to know. Domino's has its Pizza Tracker. Transit Authorities and package movers (e.g. UPS, Fedex, USPS) have theres. Consider taping into this consumer obsession. 1) Define parameters of the award - B2B versus consumer versus retail etc. The Webby and the Web Marketing Association are probably the most credible and objectively judged.